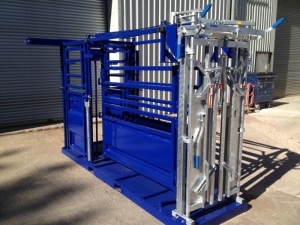 GSF Livestock Systems specialise in Cattle Handling Equipment, we design and build Squeeze Crushes, Weigh Crushes and both Mobile and Static handling systems. Cattle handling is easy with the correct handling equipment, very few items stay on a livestock farm as long as a cattle crush so its best to invest in the best. Whatever your requirements make sure you drop us an email or a call before you buy, it wont cost a penny to have a chat (Wilton – 07802 331006). We now have 2 Mobile Squeeze Crushes available to hire. Easy access 3 or 4 cow models, weigh bridge options, front parallel squeeze, EID tag reading, designed on experience – built by us to last! Watch the video! Grant advice available so ring Wilton on 07802 331006 today. We can fit weigh systems to all our crushes – both mobile and static! 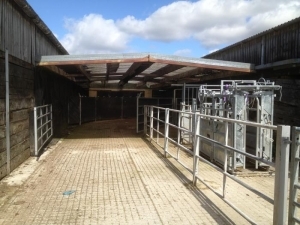 Well thought out cattle handling facilities cut stress, time and injury; you don’t need to invest massive sums to get a very efficient and “friendly” system on your farm. Our range of static squeeze crushes are all fitted with a dual sided squeeze action, with safe access to the areas needed. Just launched, our “Romney Ranger” Mobile Sheep Race! For all routine work inc drenching, drafting, mouthing etc and with various hurdle options and a weigh facility available!. Mike, Herd manager of 280 dairy cows and followers in Somerset, bought a Static Squeeze Crush complete with vet cubicle and full weighing facility. 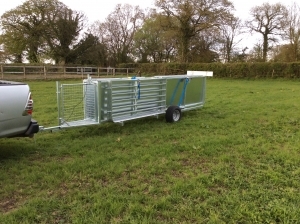 Andrew, Stockman on a mixed beef and dairy farm in Worcester, bought a 7.5 metre Mobile Squeeze Crush complete with weighing facility. 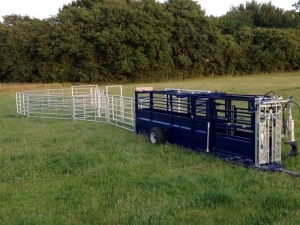 NEW******Stock Discount*********Stock Discount*****NEW We have a 6.3m Herd Master mobile system in stock ready to go. We don’t keep stock so..
******Stock Discount**********Stock Discount****** We have a 6.3m Herd Master mobile system in stock ready to go. We don’t keep stock so this..
Congratulations to Alasdair Macnab from Dingwall who has won our Static Squeeze crush. Alasdair runs a fantastic pedigree herd of limousin cattle,..
*****************Competition update******************** We have picked a winner and are waiting on a response before we announce them. "We have run nearly 900 head of stock through the crush since we bought a month ago; it works like a dream and the vets say its one of the best crushes they have used in ages, delighted." 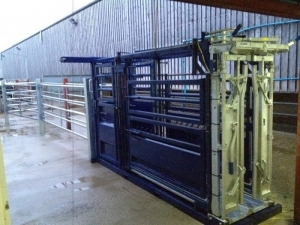 "Cattle pass through the crush like shedding sheep, they simply keep coming without the need to drive them, the dark blue paint doesn't put them off in the same way as the shine of a galvanised crush or shiny stock box"